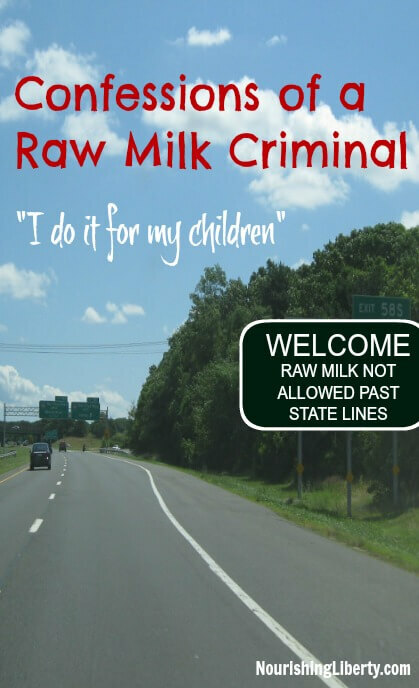 Confessions of a Raw Milk Criminal: "I'm doing it for the children." This article first appeared on Lew Rockwell last March. The shoe still fits. Not many people would look at me and see a confessed criminal. As a suburban mom with 5 small children, a minivan and a dog, it’s just not people’s first assumption about me. However, I am a repeat and proud offender of the FDAs regulation 21 CFR 1240.61 — the ban on interstate transportation of raw milk. I am a raw milk criminal. For years I have transported raw milk across state lines and have every intention of continuing to do so until this food is widely available within my home state of Maryland. About 9 years ago, when my oldest child was just beginning to eat real food, she had major problems digesting milk and milk products. After much research and thought, I decided to try raw milk for her. So I joined a cow share operation. A cow share operation is very similar to horse boarding. You buy a share in a cow and then pay a farmer to board and milk the animal and then you receive the milk from your own cow. This is a great way for suburban and urban families to enjoy the benefits of raw milk from their own animals. But, it is currently illegal in Maryland. As is transporting raw milk across state lines. Which puts me in a difficult position. We were very happy with our cow share. We enjoyed visiting the farm, petting our cow and learning about what is involved in taking care of the animals. My daughter’s health improved as a result and it was a win-win. Shortly after we began, though, the Maryland Department of Health and Mental Hygiene (MDHMH) arbitrarily changed the definition of “sale” of raw milk to include a cow share operation. They even included barter arrangements in that. It was crushing to lose access to the food that I had carefully chosen for my children and devastating to the farmer involved. The MDHMH rule already criminalized all peaceful farmers who simply wanted to share excess milk with their friends or neighbors and the altered definition destroyed the means for suburban and urban families to enjoy the milk from their own dairy animals. It is most unfortunate that the state of Maryland has actively continued to allow the criminalization of hard working, peaceful farmers who produce a product people want. With this criminalization, comes a scarcity. Because of the scarcity of fresh milk from Maryland producers, thousands of Maryland families procure their fresh milk from Pennsylvania farmers and, in doing so become criminals for transporting that fresh milk across state lines. I personally help facilitate families who want to cooperate in the procurement of fresh milk. I, and a growing number of individuals, will continue to transport raw milk across state lines and make it available to anyone in Maryland who wants it. Peaceful farmers are criminalized for providing food to eager individuals while peaceful consumers are criminalized for obtaining the food of their choice from the producer of their choice. In my capacity as an organizer for fresh milk in Maryland, I see upwards of 3 million dollars per year go to Pennsylvania farmers that could otherwise go to revitalize and restore Maryland’s rural communities. This economic setback is devastating to the already failing Maryland dairy industry. To ignore the consequences of denying the growing demand, simply means we will see a greater collapse of Maryland dairy farms and increased severe economic loss for Maryland. While King spoke these words about taking a position in protestation of war, the principle is equally important in regards to any criminalization of a peaceful, normal, natural human behavior. I make the comparison not to allude to the actual events of the civil rights movement, but because it is intolerable that ordinary people are criminalized for normal, natural, peaceful human behavior. I hope that the coming months and years show a groundswell of peaceful non-compliance with laws and regulations whose only purpose serves to criminalize the normal aspects of our peaceful lives. Thank you for being one of the wonderful heroes rebuilding a new and wonderful world for us all. It would be too hard for me to keep my own cow as I have no room. We used to have one and I love having raw milk to make yoghurt and butter. I am sure all the nutrients are compromised in commercial operations where they homogenize and “Ultra” pasteurize the milk products “for our own good”. There should be no reason that people couldn’t sign a form to not hold the farmer accountable . Most people who produce their own food do so with care to become more healthy so no problem with contamination. I support you in your civil disobedience Liz. I am someone who has recently discovered the life changing benefits of raw milk. We must all focus on the incredible positive aspects of this wonderful food and I believe we can help others big time! I just really do not understand, everyone can have cigarettes,booze,over the counter drugs, and overly processed food that cause auto immune disorders, which is all poison that destroys kidneys and liver,lungs! But we can not purchase raw milk,what are the side affects of raw milk.Salmonella,e-coli and other pathogens that could possibly be in raw milk are in other food sources,burger,veggies,eggs… We take chances with other foods already! As the owner of a herd of dairy goats, it boggles my freedom loving mind that our government can interfere in the private sale between individuals. Fresh produce is way more likely to make you sick but in my state, produce frequently gets sold on the side of our highways. Just imagine if I sold my milk like that! Good for you, Liz! I recently learned about raw milk and have been making kefir at home. So far it is really helping myself and my dogs with allergies/yeast, digestive issues, etc. We are very lucky in CA to be able to buy raw milk in one or two small specialty stores. Will pray that things change in MD soon! Keep up what you’re doing and eventually these ridiculous laws will have to be changed! P.S. You’re a great mom for fighting for your kids and doing what you have to do to help their health!